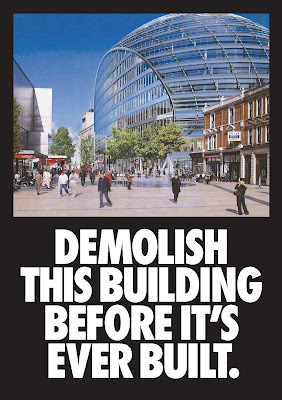 Residents are being urged to demonstrate their strength of feeling against plans to build an eleven story office building at the bottom of Hammersmith Grove by turning up to the Planning Applications Committee meeting this Tuesday, 30th October at Hammersmith Town Hall. The meeting will begin at 7.00pm. The plans for the scheme can be viewed here. The Developer (Development Securities) was given a chance to outline their proposal for the site to over 170 residents who turned up to the public meeting last Thursday evening. My fellow ward councillors and I arranged the meeting after being contacted by record numbers of our constituents on the matter. much of the extra parking would go to the NCP on Glenthorne Road. He then retracted both statements on being questioned, saying he "couldn’t guarantee when the delivery lorries would turn up". And, went on to admit that he also knew that the Glenthorne Road NCP closed at 8.30pm and so also could not ensure that people visiting the 400 seater cinema or any of the three restaurants would park in it rather than local streets. Andy Slaughter MP (Lab) then asked the developer why they were “squeezing a quart into a pint pot”. The developer replied that they wanted “to make as much profit as possible”. One member of the audience asked why a cinema was included in the design. The developer explained that they had done this on request from H&F Council last November. H&F Council's Director of the Environment was also at the meeting and confirmed that had been the case. This links the scheme into H&F Council’s plans to demolish the King Street cinema and replace it with new state-of-the-art offices for Town Hall officials. The developer said that H&F Council had commissioned a traffic survey which was carried out by independent experts. I have not been given a copy of this despite asking for it on August 6th. The report will have hopefully considered the consequences of the road narrowing, the large number of extra delivery lorrries and the extra traffic. The audience expressed shock when H&F Council's Director of the Environment told them that he did not have "the details to hand" and was therefore "unable to answer any of any questions on the matter". He referred people to the planning report. The Brackenbury Residents’ Association (BRA) and the Hammersmith Society attended the meeting and sat on the panel - with Richard Winterton and Angela Clarke speaking persuasively against the scheme while representing each residents' group respectively. Cllr. Stephen Greenhalgh (Con), the Leader of H&F Council, declined an invitation to attend or to send any of his colleagues to take part on the panel. The Conservative MP for Hammersmith and Fulham also declined an invitation to attend. BRA and the Hammersmith Society are opposing the scheme along with the H&F Community Trust, the H&F Historic Buildings Group and the Cambridge Grove Residents' Association. BRA have put posters up throughout the area (see pic) and are asking people to come to Tuesday night’s meeting in a last ditch effort to make all of the ten councillors sitting on the Planning Applications Committee see sense and turn the scheme down. The hope then is that local people, ward councillors, residents associations and amenity groups will be given a chance to open a dialogue with H&F Council and the developer about what may be a more suitable scheme for that site. Please come along this Tuesday night if you can. You can email me here for more details. Indeed, the look of a building is something we may or may not like. This debate is not about the look, it's about removing the local cinema, re-accommodating the Council and increased traffic and pollution. I think it's really disappointing that neither the conservative councillors nor the local conservative MP turned up to the meeting - they seem to be strangely silent on the matter. They aren't all on the planning committee so are they no longer interested in what local people have to say now they've taken our votes? At least one of them seemed to think the elvis impersonator (and a bottle of red!) in the Salutation pub was more important that night!